Tyre Sizes for New Suzuki Jimny 2019? Replied by Busta on topic Tyre Sizes for New Suzuki Jimny 2019? One thing that we can be sure of is the gearing will still be very sensitive to increasing tyre size. The bigger engine will mitigate this slightly, but you're still going to run into issues going much bigger than standard. I suspect you would also have warranty issues- I'd be very surprised if they honoured the warranty on anything related to the axles, transmission, engine, brakes and steering knowing you have fitted bigger tyres. Replied by MrPaynterZA on topic Tyre Sizes for New Suzuki Jimny 2019? Just chiming in to follow along and see what fits! I have a spanking new JB74 here in South Africa and whilst I have no plans to upgrade the tyres, I am definitely interested in what would fit. Replied by Gadget on topic Tyre Sizes for New Suzuki Jimny 2019? The nice thing with having stock 195/80R15 tyres on the new model is that a 215/75R15 replacement is only a 1.5% increase in diameter, rather than a 5.3% increase moving from the old model's 205/70R15. Will be whipping off the alloys and fitting steelies with 215/75R15 BFGoodrich All terrain KO2s once mine arrives. Replied by Daz3031 on topic Tyre Sizes for New Suzuki Jimny 2019? I also plan to fit 215/75r15 on a second set of steelies once mine arrives. They'll obviously fit with no issues being only a 1.5% increase in diameter. However does anyone have any idea regarding what size/offset of wheels will fit? 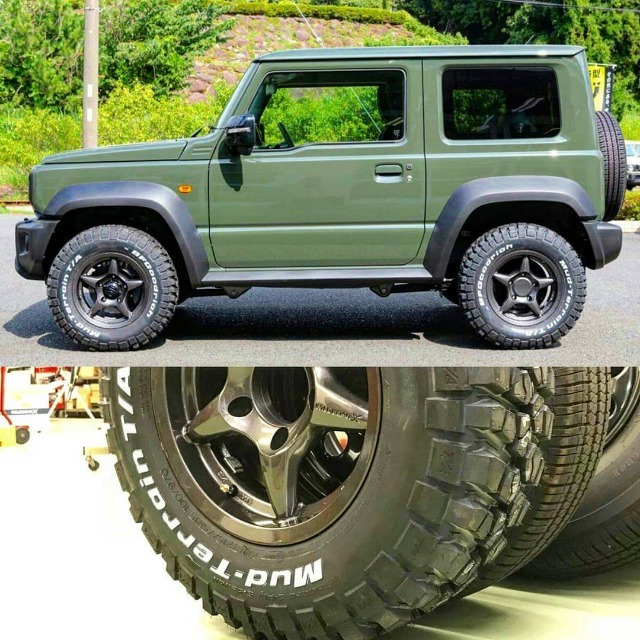 The info I have found online suggests the new Jimny has a 15x5.5j wheel with a +22 offset, which is a bit of a change in offset from the old one. The nearest match I have found so far for a reasonable price is a 15x7j wheel with an offset of +7 from 4x4tyres. This would mean they sit 4mm closer to the struts but also poke out a further 34mm. I appreciate no one will know for certain as no one has taken delivery yet, but do you think they would fit ok? Found this helpful image online which shows a new Jimny on 215/75r15 BFG Mud Terrains. An internet search suggests the wheels are 15x6j with an offset of -5 so it seems like the wheels I'm looking at should fit without any major issues. Replied by Lambert on topic Tyre Sizes for New Suzuki Jimny 2019? It's often struck me as odd that Suzuki didn't design their off road car around a more common tyre size with more and various off roading tread forms. Replied by saxj on topic Tyre Sizes for New Suzuki Jimny 2019? Biggest you can fit without any rubbing or trimming is 215/80R15s. 235/75R15s rub. saxj wrote: Biggest you can fit without any rubbing or trimming is 215/80R15s. 235/75R15s rub. Thanks saxj - very helpful. Do you know what offset the standard wheels are? I've seen both +5 and +22 quoted online. Replied by Bob1050 on topic Tyre Sizes for New Suzuki Jimny 2019? Looking forward to some definitive specifications. My new Jimny is coming with Alloys and standard tyres but a forthcoming trip to the Scottish Highlands makes me think a set of steel rims and tyres with a more snow and mud capable tread might be a good idea. Replied by Bill Portland on topic Tyre Sizes for New Suzuki Jimny 2019? No idea, but I'm pretty sure they are all the same. I have SJ rims on mine, another mate has JB23 mags on. I can't see any difference. The ones we get have really crappy Dunlop tyres on. Everyone I know has changed them. As far as I know you should get the the Bridgestone tyres that they had on the demo models, which are marked M+S. Last edit: 03 Jan 2019 11:56 by saxj.